Premium vinyl boat wraps deliver a striking appearance on the water, combined with significant lifestyle & economic benefits. Wrap It Marine offers a range of expert vessel wrapping services. Whether you’re looking for external or internal vinyl solutions, branding, window tinting, anti-slip flooring or safety signage, we do it all. Wrap It Marine can provide you with a ‘start to finish’ solution for your vessel. One call and we take care of everything for you from the surface prep through to the design and installation, which means you have a faster turnaround, less cost and smoother processes. 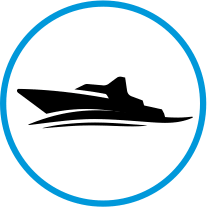 For a boat that is out of the ordinary, our graphic designers are experienced in designing artwork to suit the curves and special design needs of marine vessels. 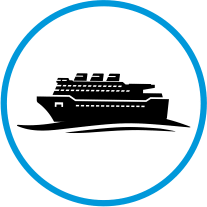 Whether you need interior wraps, hull wraps, non-slip floor and deck coatings, or even safety and identification signs, our specialist team will deliver an exceptional result. Our expertise in marine wrapping has been recognised by 3M. 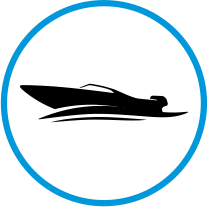 Wrapit Marine are the only Marine Specific installation company in Australia that is a 3M Select Member Gold Level and 3M Preferred Graphics Installer. 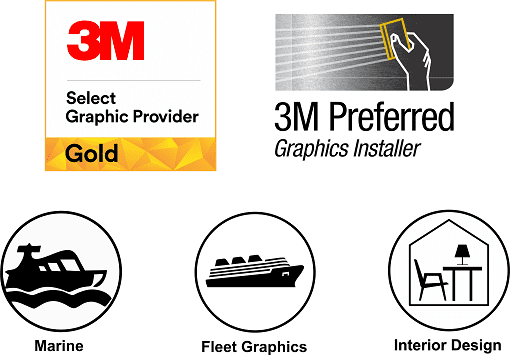 While there are other 3M installers accredited for vehicles and other applications, there is no other Australian company other than Wrapit Marine accredited as 3M Select Gold and 3M Preferred Graphics Installer that specialises in Marine applications. Because of our expertise and 3M accreditation as currently Australia’s only Marine Specific Company with 3M Gold Select Member and 3M Preferred Graphics Installer recognition, we have access to written product & installation warranty’s. These written warranties are only available to recognised 3M partners. The word “warranty is thrown around in the industry often confused with “Durabillity”. Example – You can expect a durability of up to 10 years, but the actual warranty is 5 years. Because every project and every vessel are different, each warranty is individually determined. This may change depending on the material selected, the location where the material is applied and other variables. With our individual written project warranty’s, not only is product guaranteed, so is our installation. If your wrap fails within the warranty period, then you can trust that any issues will be promptly dealt with by 3M and Wrap It Marine. No other marine specific wrap company in Australia can deliver this level of certainty and warranty for your vessel.